Last month I had two consults within two days of each other that really stuck out for me. In the first the couple had a carrier that one of them was really struggling to use. I helped both build confidence with this carrier but ultimately while it fitted one of them well, it was simply too big for the other and all the adjusting in the world couldn’t get it any smaller. They told me they’d been to a big name high street store and told this carrier was their best seller and the best money could buy. They hadn’t been invited to try it on first. It was sad because it was clear they didn’t want to buy another carrier but were left with something that was worthless for at least one of them. The second consult, two days later, was the complete opposite story. They’d been to a big high street store (same chain but different location) and received really excellent advice. The sales rep had talked them through the pros and cons of several different carriers, invited them to try each of them on and the couple had walked out with a LILLEbaby carrier that they absolutely love and use every day. They came to me for a consult simply because while they use their LILLEbaby out and about they also wanted a light weight soft carrier they could use around the house. They told me how much of a difference babywearing had made for all of them – mum, dad, baby and even granny! And how pleased they were to have got that advice in the store. Meeting these two couples back to back like this really drove home to me how important this first experience with baby carriers is. Like the second couple I was lucky and got great advice, but I have met so many couples who haven’t and feel regretful that they bought the wrong thing. Of course the best place for advice is an independent sling library such as Sheen Slings. The range of different types and brands of carriers available at any sling library far outstrips any high street store, not to mention the specialist knowledge and training independent sling consultants have. However, the reality is that the vast majority of people have never heard of sling libraries and their first experience with baby carriers in on the high street. So when the opportunity arose to go into high street stores and train their staff on LILLEbaby carriers I grabbed it with two hands!! 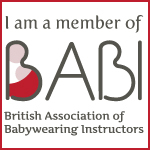 On Friday, I travelled up to Birmingham and with several other sling consultants attended training to become LILLEbaby Ambassadors. The main part of my new role will be carrying out in store training and hopefully helping to ensure more and more parents have an experience like the second couple. Not that they need to necessarily get the same carrier, but that they leave the store feeling informed, empowered and with a carrier that works for them! How long will my buckle carrier last?